The best wedding images are the ones that make you smile every time you look at them. Posed portraits are essential, but the candid captures of pure joy are the ones you'll come back to over and over again. Living your wedding with reckless abandon and truly experiencing the emotional rollercoaster of the day will come across in your images; our best work comes from a tight symbiosis with our clients who trust us to deliver beautiful images of them enjoying the heck out of their wedding. This trusting relationship is one that we always hope to earn; it's always helpful for us to photograph the engagement session for this reason, or to at least sit down to a great cocktail and dinner with you before the stress of your wedding planning overwhelms you. 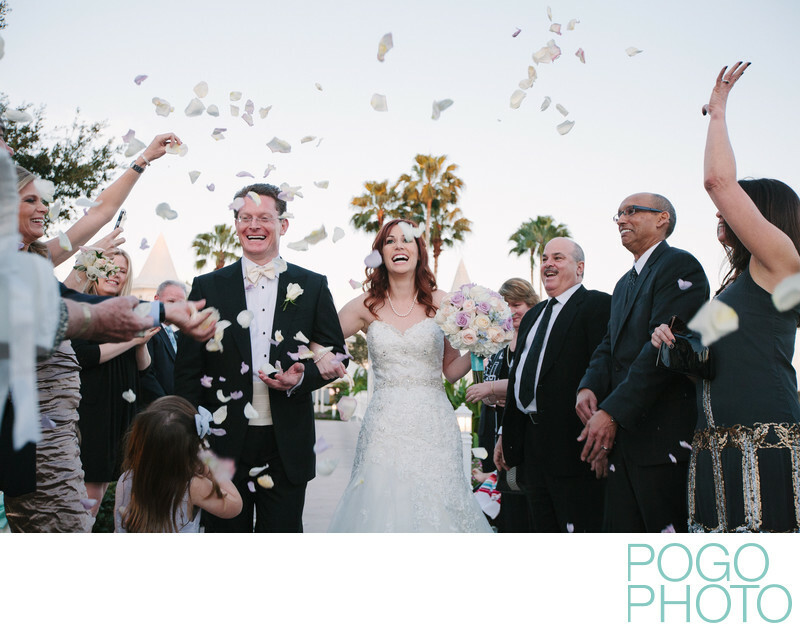 Once you've let your guard down and can relax around us, knowing that we'll create beautiful photographs of your celebration, our relationship starts to flow, and great things start to happen. Destination weddings at Disney World in Orlando don't have to be overly cartoonish; it really is the happiest place on earth, and a mature, magical celebration can take place at any number of locations throughout the property, including this exit at the chapel at the Grand Floridian, just moments away from the Magic Kingdom. This ceremony was followed by a dinner reception at California Grill in The Contemporary, which served a multi-course meal fit for foodies. Capping off the evening on the rooftop viewing area for Wishes, Disney's nightly fireworks, is an incredible way to launch your marriage into happily ever after. Location: 4401 Floridian Way, Bay Lake, Florida 34747. 1/400; f/4.0; ISO 1000; 34.0 mm.